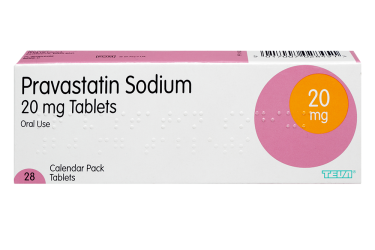 Pravastatin is a statin used to control high cholesterol. Order your repeat supply of pravastatin online - our service is fast and convenient. To place your order, fill in our brief medical questionnaire and select your medication and dosage. One of our online doctors will review your order and approve appropriate treatment. Please note, that this service is for patients who have been using pravastatin for at least three months only. We offer 10mg, 20mg and 40mg tablets. Is Pravastatin Right For Me? Pravastatin (also known as pravastatin sodium) is a type of statin, a group of drugs used to control high cholesterol (hypercholesterolaemia). It reduces the amount of “bad” cholesterol and triglycerides (another type of fat) in your blood, whilst increasing your levels of “good” cholesterol. This reduces your likelihood of developing heart disease or suffering a stroke or heart attack. Pravastatin is usually combined with a programme of healthy eating and exercise. Cholesterol is largely produced by your liver and your body needs a certain amount to function. It is transported around the body via the blood system by combining with protein to form molecules called lipoproteins. There are two main types of lipoproteins, low density lipoproteins (ldl cholesterol) and high density lipoproteins (hdl cholesterol). An excess of ldl cholesterol, also known as “bad” cholesterol, collects in your blood vessels, causing them to thicken and harden (atherosclerosis), and potentially become completely blocked. Hdl, or “good” cholesterol, removes excess ldl cholesterol from your bloodstream and transports it to the liver to be broken down and eliminated. Pravastatin works by reducing the amount of ldl cholesterol made by the liver. It does this by blocking the action of a key enzyme required for cholesterol production. Pravastatin also reduces your levels of triglycerides, other ‘bad’ fats that are found in the blood. By reducing the concentrations of hazardous fats in your body, pravastatin helps prevent you from developing heart disease or suffering a stroke or heart attack. If you have high cholesterol and find that a regime of healthy eating and lifestyle choices is not effective enough in reducing your cholesterol levels. If you have already suffered a heart attack or have unstable angina but you have normal cholesterol levels. If you have had an organ transplant and your immunosuppressive medications are causing an increase in your lipid levels. If you have genetically high cholesterol levels (familial hypercholesterolaemia). In this case, pravastatin may also be suitable for children aged 8-18. Are pregnant, breastfeeding or trying for a baby. Have active liver disease or unexplained abnormal liver functioning. Are allergic to any of the ingredients in pravastatin. Pravastatin comes in tablet form and is taken orally. It is usually taken once a day, and should be swallowed whole with a glass of water. It can be taken before or after food. Your body produces more cholesterol at night, so pravastatin is most effective if you take it in the evening. You should aim to take it at same time each day. Pravastatin comes in several different strength doses (10, 20 or 40mg). Your doctor will decide which dose is right for you. It is important that you follow the instructions given by your doctor. Don’t stop taking the medicine unless advised to by your doctor. Pravastatin should be taken every day on a long-term basis, so it is best to establish a routine to make sure that you don’t forget to take it. However, if you do miss a dose, leave out the missed dose, but make sure you take the next dose. Don’t take two doses together. What should I do if I take more than one dose at once? If you take more than your daily dose, or if someone accidentally takes your medicine, contact your nearest A&E department immediately for advice. Where can I get Pravastatin? Pravastatin is only available on prescription from your doctor, following an assessment of your cholesterol levels. For your first assessment and prescription, see your GP. You can order a repeat supply of your statin from Superdrug Online Doctor. Fill in our brief assessment questionnaire and select the statin you are currently taking. One of our online doctors will review your information and assess whether you can continue your treatment. Muscle cramps, pains, or weakness, particularly if you also have a fever. Symptoms of a possible allergic reaction, including itching, swelling around the mouth or face, dizziness, trouble breathing or a skin rash. Signs of potential liver problems, including yellowing skin, dark urine, and severe stomach pains. It is important to avoid drinking excess alcohol while you are taking pravastatin. On rare occasions, statins have also been known to cause or worsen diabetes. Can Pravastatin Interact With Other Medications? Pravastatin can interact with other drugs you may be taking to lower cholesterol, such as cholestyramine or colestipol. In this case, you should take your pravastatin tablet either one hour before or four hours after taking these medicines, as they can prevent the absorption of Pravastatin, reducing it’s efficiency by up to 50%. Some anti-HIV medicines can reduce the amount of pravastatin in your blood, making it less effective. The interaction of pravastatin with some drugs may increase your risk of developing muscle problems. It is important to talk to your doctor about all other medicines you are taking before you start taking pravastatin.